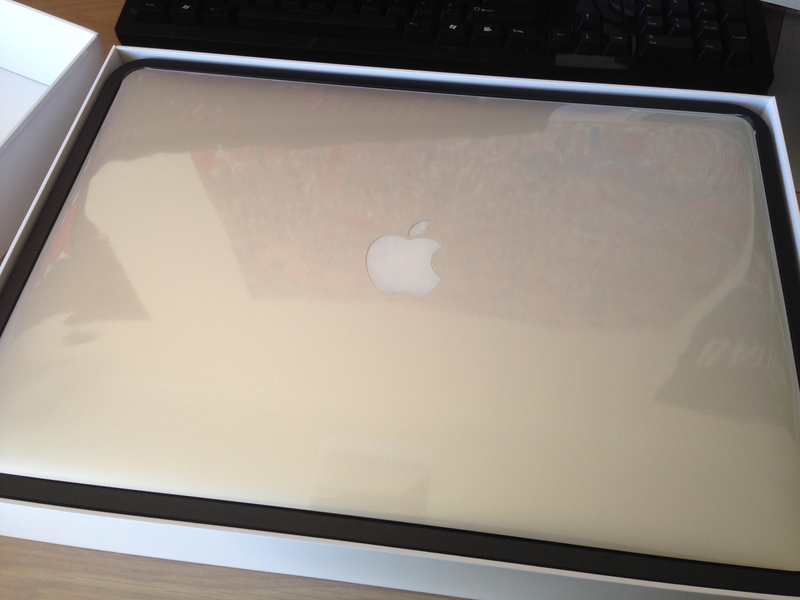 At the start of the year, I picked up a MacBook Pro with Retina display. Half late-graduation present, half-birthday present to myself. It’s the best Mac I’ve ever used, but then again, why wouldn’t it be? I mean, you would think that given the innumerable and considerable technology advancements since the last time I purchased a Mac (March 2011), that any new Mac would improve upon every aspect of my previous Mac and then some. I don’t know about you, but I would definitely be questioning what the tech industry was doing if there were regressions of any kind. Thankfully, there aren’t. I’m excited to say that the MacBook Pro with Retina display gets pretty damn close to my perfect machine. 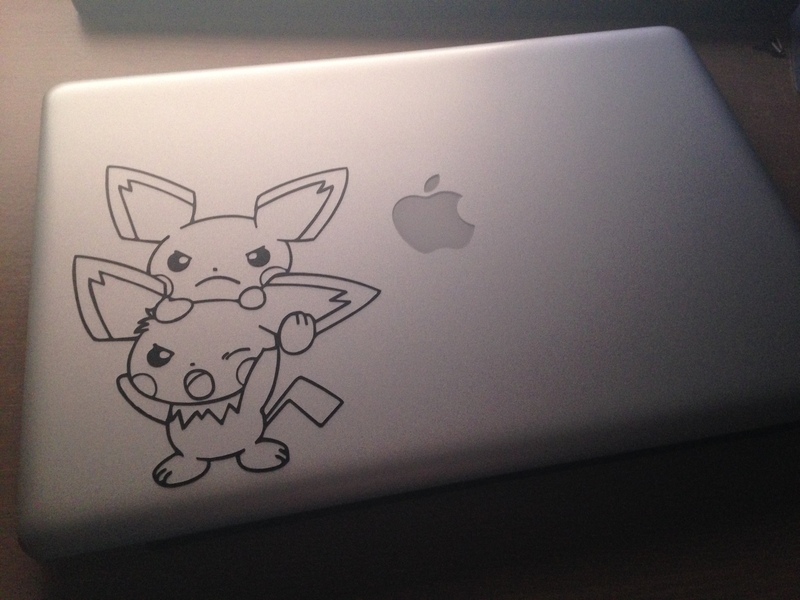 It’s everything I’ve ever wanted from a portable Mac. It’s powerful without being too bulky or heavy. It has great battery life without sacrificing portability, and while it may not be as upgradeable as I’d like (more on this in a bit), that’s a compromise I’m willing to accept for a machine that is otherwise everything I’ve ever wanted out of a personal computer, especially seeing as Apple offer configure-to-order options that satisfy the vast majority of customers, including your truly. Because specs matter, my MacBook Pro comes with 16GB of RAM and 1TB of flash storage. The amount Apple charge for the 1TB flash storage upgrade borders on the extortionate, but there’s a price for everything, and that was a price I was willing to pay for some of the highest-performing flash storage around. Yes, my new MacBook Pro cost me a pretty penny, but considering this is a computer I’ll be using for hours at a time, every day for the next three to four years, I think the price was pretty reasonable. And since my Retina MacBook Pro now supports 4K displays at 60Hz, I don’t think I’ll be upgrading from this machine any time soon. Maybe I’ve been in the Apple game too long, but I’ll admit even I rolled my eyes when Phil Schiller took to the stage and introduced the very first MacBook Pro with Retina display, with its asymmetrically designed fans that were designed to reduce audible fan noise (or tonal impact, as the Apple website states). But after not hearing any kind of whirring sounds from my Mac except when I’m pushing it hard, I’m a believer; the asymmetrically designed fans make a difference, and they’re not the only design aspects of the Retina MacBook Pro that do. I’m not as sensitive to heat or fan noise as Marco Arment might be, since my MacBook Pro sits on an elevated desk stand most of the time, but fan noise is not usually something that bothers me. I have a PC which whirrs along the entire time it’s powered on regardless of whether it is sitting idle or working hard, and while it can get annoying over an extended period of idle time, I don’t usually hear it over the sounds of explosions, gunshots, or whatever game I’m playing at the time. But late at night, or in the early hours of the morning, when it’s just me, my MacBook Pro, and the almost, not-really, silent clicks of my mechanical keyboard, I appreciate the fact there’s basically no fan noise. It’s one of those little Apple touches that makes all the difference. I customised my previous MacBook Pro to have the high-resolution anti-glare display, which dropped the glass and glossiness of the standard display and replaced it with a (much nicer, in my opinion) matte option. Unfortunately, Apple doesn’t make that an option on the new Retina MacBook Pros, and I was initially concerned about how glossy and reflective the Retina MacBook Pro display would be, insanely high resolution aside. In hindsight, I should have realised, as a bedroom-dwelling nerd who keeps the curtains shut the majority of the time, that I needn’t have worried. Reflections simply aren’t an issue, unless you’re trying to use the machine outside in the bright sunshine, where you have to worry about the sun trying to kill you before you worry about the bright sunlight reflecting off your MacBook Pro display. I took the opportunity of a new Mac to upgrade my desk a little, too. 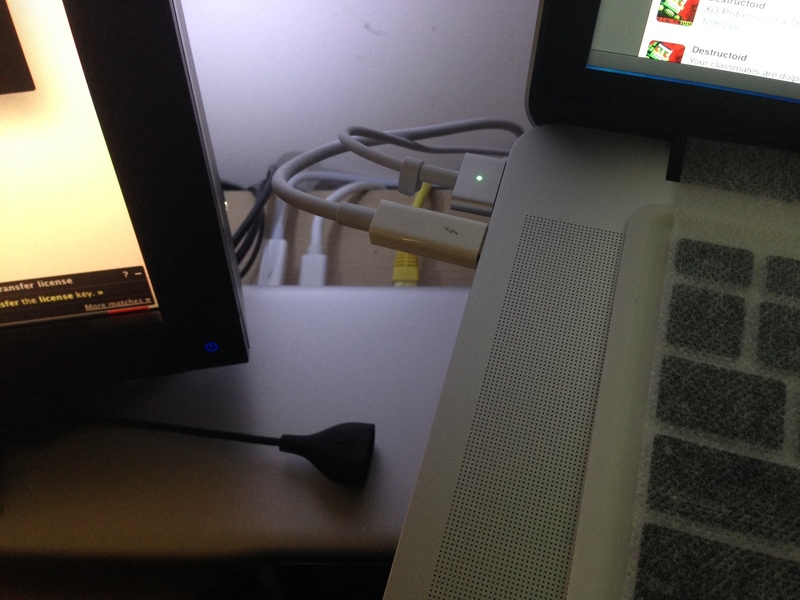 My old early 2011 MacBook had a Thunderbolt port, but I never used it to plug into any Thunderbolt peripherals. Instead, the Thunderbolt port in my old MacBook Pro was used to connect to my display, effectively turning it into a mini-DisplayPort. That worked out just fine, but it meant that I filled almost every port on the old MacBook Pro when it tethered at my desk. MagSafe for power, Ethernet for network (I have a NAS, and Wi-Fi doesn’t cut it for big file transfers), Thunderbolt for the external display, one USB for my iPhone dock, another for a 4-port USB hub (which attached my keyboard, an external hard drive for Time Machine, and any other USB peripherals on an as-needed basis), and the headphone jack for my Audioengine 2 speakers. Now you know why I said my MacBook Pro was “tethered” to my desk earlier. With my new Retina MacBook Pro, I decided to grab a Thunderbolt dock, turning many cables into one. The dock I chose was the Belkin Thunderbolt Express, and despite hearing many mixed reviews about it, it was available locally which meant I’d be able to bring it back to the store I bought it from, if I did have any issues. Thankfully, it’s been pretty smooth sailing so far, and besides a small hiccup which was more or less my own fault, I’ve had exactly zero issues with it. A few niggles — it does get surprisingly warm, even hot to the touch after prolonged use, my speakers now make a small “pop” when the Retina MacBook Pro sleeps or wakes up (likely to do with the Thunderbolt interface rather than anything else), and while the dock itself has decent enough aesthetics, it comes with an extremely cumbersome power brick — but nothing too serious1. Now, just two cables plug into my Retina MacBook Pro when I’m at my desk. One MagSafe 2, and one Thunderbolt cable, which attaches to the same peripherals I was using earlier. It’s a hell of a lot more convenient, and also looks a lot neater. Now that the bush has been suitably beaten around, and the lede similarly buried where only the bravest dare venture, it’s time to talk about the elephant in the room: the Retina MacBook Pro as an appliance instead of an actual, upgradeable, computer. If you were to take a Retina MacBook Pro out of the box, it would be true that you wouldn’t be able to upgrade it yourself in any regard. But by the same token, the idea is that the machine you just unboxed would be the best damn computer you’ve ever used, ability to upgrade internal components aside. In this author’s not-so-humble opinion, the advantages of a portable, powerful Mac that gets great battery life far, far outweigh a bulkier machine that you can put a new hard drive in every year or so. For an example of this, look no further than my previous Mac. While it was still performing admirably with the same storage capacity and RAM as my new MacBook Pro, when I passed it onto my sister for Uni she went out and bought a Chromebook because she wanted something that was more portable than the bulky, heavy, MacBook Pro. And to be honest, I don’t blame her — I myself didn’t bring my early 2011 MacBook Pro out on many occasions, just because it was too bulky and heavy to lug around2. Look at this way: you might not be able to upgrade the hardware in the the Retina MacBook Pro, but the way I configured mine means it won’t need to be upgraded, and when it does, I’ll probably be the market for a new laptop anyway. I can understand not wanting to spend upwards of $3000 on a new Mac, but if you have to upgrade your computer every other year anyway because it doesn’t have enough space, isn’t it worth spending a little extra for a little extra longevity? The loss of a user-replaceable battery was just the first step towards innovation via integration. Not being able to remove or replace the battery in the MacBook Pro meant more capacity, which meant longer battery life, and I don’t know anyone that has ever complained about that. In this case, the advantages outweigh the (perceived) drawbacks. The iPad is another example. It comes with a fixed amount of non-expandable storage, but if you’ve ever experienced the kind of hell associated with SD card usage Android tablets have, you’ll know there’s a very good reason for that. Because we’re paying Apple to make those kinds of decisions for us, it’s their job to make sure the products they make provide the very best user experience. Coming back to my original point, people only expect computers to be upgradable because that’s how they’ve been for the past umpteen years. But sometimes, innovation requires sacrifice — and if that means I can get a more powerful, more portable machine that can’t be upgraded like the Retina MacBook Pro, a slimline all-in-one desktop like the iMac, or a revolutionary new workstation in an extremely unique form factor like the new Mac Pro, then so be it. Make no mistake: it started with the MacBook Air, and finished with the Retina MacBook Pro. Computers are appliances now, and I’m OK with that.